Last weekend saw the annual cheese-rolling festival take place in the UK, amid its usual competitiveness and ambitious athleticism. And yes, you read that correctly. Cheese-rolling. After seeing the images from this particular event, it got us thinking about the many other weird and wonderful festivals that take place around the world every year. Some extensive (and amusing) research later, we're proud to present a round up of our favourite quirky festivals - and ones that we'd just love to experience for ourselves! The cheese-rolling gets underway at Cooper's Hill. Image credit: Dave Farrance. 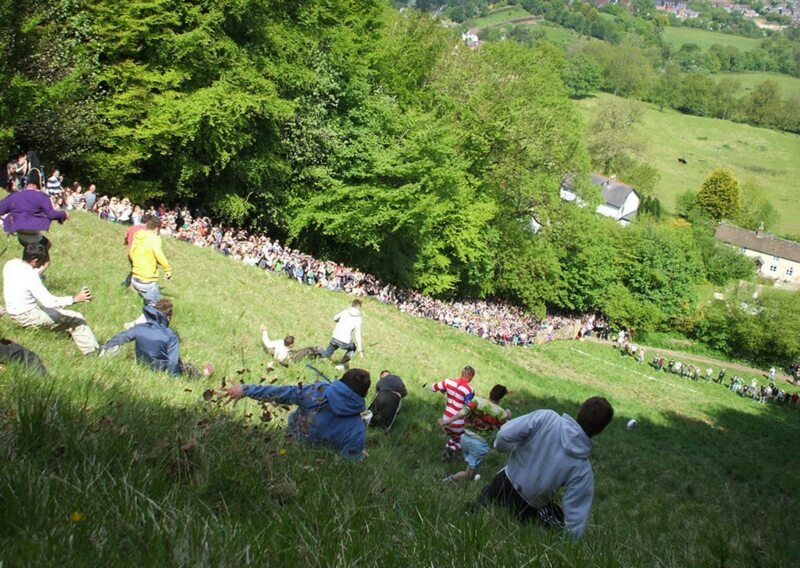 Since this event was the inspiration behind this post, we couldn't leave out a mention of the annual Cheese-Rolling at Cooper's Hill. The truth is, the origins of this activity stretch back to the 15th Century - and it looks like this event is here to stay. The Cheese-Rolling Festival takes place near Gloucester. Essentially, the main event involves rolling a round of Double Gloucester cheese down a hill while competitors do their best to chase after it. The person who gets over the finish line first gets to take home the cheese. It may sound like a questionable way to spend your energy, but the festival draws runners from all over the world keen to take on the challenge! Describing itself as a 'grand gathering of merfolk and pirates', this North Carolina-based festival is all about living out your childhood fantasies of becoming a mermaid. With its headquarters at an aquatic centre, festival events include group swims, photography sessions and the chance to get hitched while in costume. This is one of the newer festivals on our list, but judging by the fact that over 300 'merfolk' turned up at 2015's event, we'd say that the NC Merfest will become a permanent feature. You may as well start preparing your costume now; the event is frequented by people with 'professional mermaid' as their job title! If you're a neat freak, walk away now. 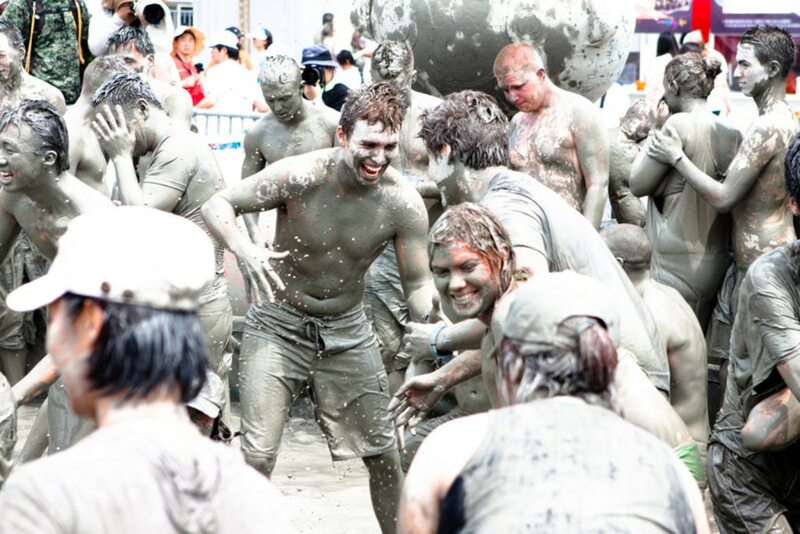 The Boryeong Mud Festival celebrates the very thing you'd expect: mud, and there'll be lots of it. This two-week-long summertime festival takes place in the South Korean town of Boryeong. The festival originally began as a means to promote the benefits of mud-based cosmetics but, every year, it has attracted millions of people just looking for an excuse to get muddy. Among the attractions, you'll find a massive mud bath, mud slides and competitions for activities like mud skiing. There'll be body paint and live music, while participating beauty centres offer massages and other treatments involving this mineral-rich resource. We found many animal-related festivals during our research, but Tunarama definitely takes this theme to a new level. Since the first event in 1960, Tunarama has introduced the world to a new sport: tuna tossing. It's exactly what you think it is. People gather in Port Lincoln, Australia, to watch as competitors attempt to throw a tuna fish as far as possible. It's a full-on three-day event, where the tuna-tossing championship is complemented by live music, a food fair and a fireworks show. Port Lincoln is guaranteed to be packed to the gills (oh, go on, it had to be done), so, if you're feeling brave, sign up for your place in the tuna-toss spotlight. 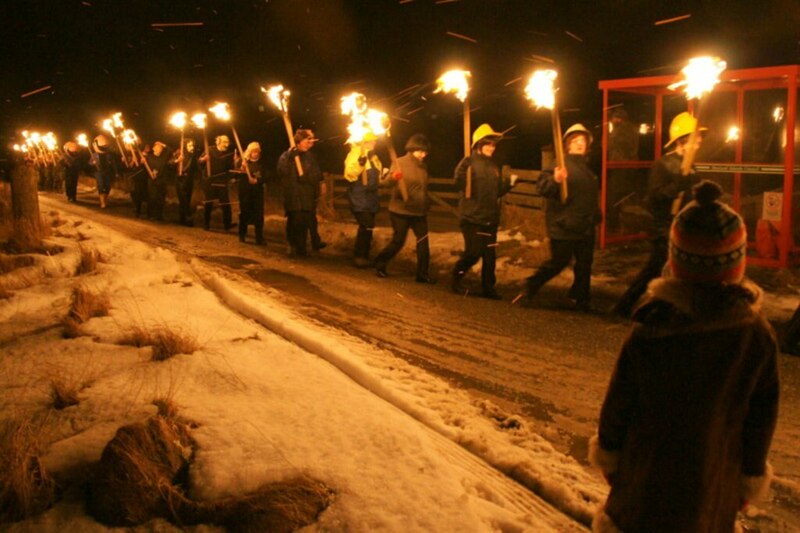 A torchlight procession at Up Helly Aa. Image credit: Mike Pennington. For a day at the end of January every year, locations across Scotland's Shetland Islands are taken over by a festival called Up Helly Aa. It's been nicknamed the 'Viking Festival' and there's a strict schedule for what goes on during the day. Lerwick is the main location for Up Helly Aa, where thousands of people come to watch the day's parades. In a nutshell, a head 'Jarl' is appointed, who will then lead the rest of the participants, all of whom are guizers (actors in mumming plays), through the activities of the day. It all culminates in a torchlight procession, where the torches are thrown onto a replica Viking ship. Up Helly Aa is held to celebrate the end of yule season; given the fact that the festival takes place in the dead of the Scottish winter, that bonfire must be a welcome sight! Yes, this may be a competition, but it is accompanied by a festival atmosphere. Plus, we couldn't leave out something as unique as wife carrying, could we? Taking place in Sonkajarvi, Finland, the Wife Carrying Championships is a two-day event, where competitors fight it out for the win in their categories. The premise behind the sport is simple: a man carries a woman while navigating an obstacle course. Despite the name, that woman doesn't have to be his wife, and there are all sorts of complicated rules concerning weight, method of carrying and so on. When there's no wife-carrying going on, spectators can partake in activities like karaoke, watch a dance show or buy food from the market area. A display at the Night of the Radishes. Photo credit: Drew Leavy. Surely, this is the festival for all those people hiding a secret talent? After all, when it comes to skills, we can't think of a single person who could say that their most impressive one pertains to being a talented carver of vegetables. Maybe that's because they're all in Oaxaca, Mexico. Like many of the festivals listed above, there's a competition involved. In this case, great pride is taken in growing and then carving the oversized radishes from this region, resulting in the Night of the Radishes on 23 December. It's said that this tradition began in the 18th Century. One year, there had been an abundant harvest of radishes, which were left to grow unhindered. Some friars found these mutant, contorted radishes and brought them along to Oaxaca City. 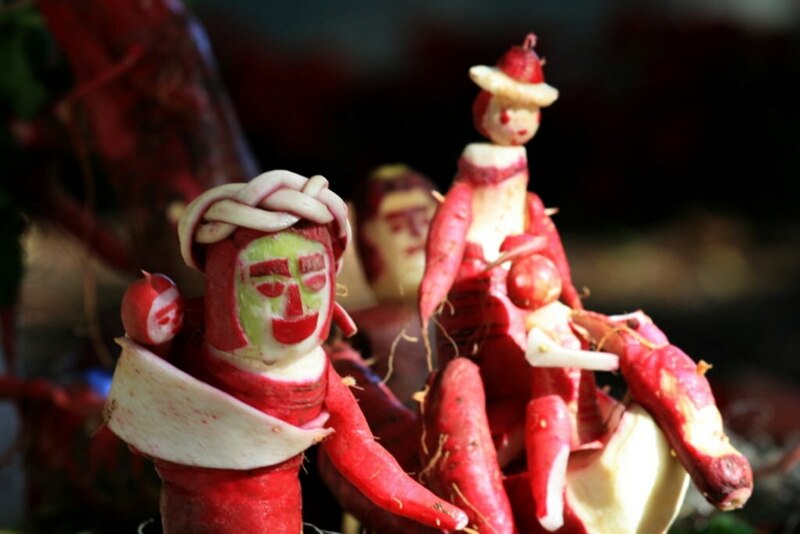 Nowadays, this event is all about carving the radishes to try to create the most impressive display. The prize? No, it's not vegetables, but a rather enticing amount of cash! Watching the main event of this festival would be a nerve-wracking ordeal. After all, the Baby Jumping Festival culminates in just that - jumping over babies. Placed on mattresses, babies born in the past year lay there as jumpers, dressed up as devils, proceed to jump over a succession of these mattresses. El Colacho, a traditional Spanish holiday, is part of a week-long celebration of Catholic feast of Corpus Christi held in Castrillo de Murcia. The jump is said to rid the babies of any traces of original sin, allowing them to live purer lives in the years to come. Injuries have been reported in the past, but - luckily - these have all been inflicted on the jumpers! It feels right to end this post with a festival about food; unfortunately, none of it will be for you. As the name suggests, the Monkey Buffet Festival in the Thai province of Lop Buri is a feast for the region's monkey population. 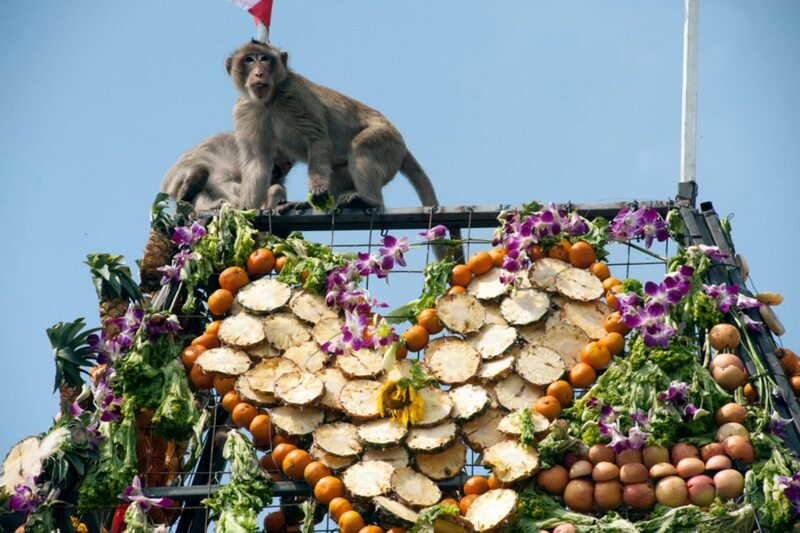 As a gesture of thanks to the monkeys for bringing in tourism revenue, the local population lays out over 4,000 kg of fresh fruit in front of the province's temples. Thousands of people travel to witness this almost unbelievable scene - and we wish we could join their ranks. Tuna tossing, radish art and Viking bonfires - these are the features of some of our favourite weird and wonderful festivals. Have you come across any other quirky festivals on your travels? We'd love to hear about them in the comments below!